The TPAS® 2017 release is here! Join us for a free live, interactive webinar on October 11 at 1pm EDT to learn about brand-new TPAS® features. If you’re new to TPAS®, we’ll also cover some of the basics about how surveying with TPAS® in the field can save you time in the office while producing a more powerful deliverable. Learn how TPAS® (the Tablet PC Annotation System) software enables project teams to collect data, analyze findings, share online and create reports. TPAS® facilitates the direct-to-digital collection of survey data in the field using AutoCAD, streamlining the preparation of reports, cost estimates, and design documents. Users can choose from a standard library of condition annotations, or create custom data capture fields that can easily be applied to the documentation of buildings, infrastructure, and cultural resources. TPAS® is ideal for existing conditions documentation, but its applications are as limitless as your reporting needs. This webinar will demonstrate the capabilities and newest features of TPAS® 2017, including a download that allows clients to interact with deliverable AutoCAD drawings produced with TPAS®, without needing a full TPAS license. We’ll also showcase the cloud-based web portal for interactive viewing and analysis of project data, drawings, and photographs, and collaboration among multiple project team members. Last year, Chambers, Murphy & Burge (CMB) performed a Conditions Assessment of the First National Bank building in Youngstown, Ohio. The 1929 building is among a group of seven early 20th-century office buildings in downtown Youngstown listed in the National Register of Historic Places. First National Bank was designed by Youngstown Architect Morris W. Scheibel and was originally known as the Metropolitan Savings and Loan Co. Building or Central Tower. This 18-story, art deco skyscraper has a high degree of historic integrity and typical of its time, was constructed with structural steel framing that supports its exterior masonry. The west elevation includes four major exterior corners due to the north- and south-facing return walls at the center window bays. CMB utilized TPAS® to identify corners with serious vertical crack systems caused by corrosion of underlying steel columns and cyclical thermal expansion and contraction. During the course of the investigation, CMB noted that brick cracks previously treated superficially with sealant have failed because the underlying conditions and mechanisms of deterioration had not been addressed. Using TPAS CMB was able to clearly illustrate to the owner the extent of such deterioration and make recommendations for long-term repairs. For this recent Conditions Assessment and Preservation Master Plan project at the John Brown House in Akron, Ohio, Chambers, Murphy & Burge (CMB) used TPAS® to identify exterior conditions for the purpose of evaluating the building envelope and generating a prioritized list of repair items. After preparing photo elevations, our TPAS assessment was conducted efficiently in the course of one day. The John Brown House in Akron was originally a 1.5-story Greek Revival Cottage that has undergone significant additions and modifications altering its appearance and creating challenges for cyclical maintenance as well as interpretation and presentation. With TPAS CMB documented observed conditions based on severity, extent, location, and priority. John Brown was born on May 9, 1800 in Torrington, Connecticut. In 1805, he moved with his family to Hudson, Ohio. In 1844, Brown moved his family to Akron where they lived in a two room cottage that came to be known as the John Brown House. Brown rented the House from Colonel Simon Perkins with whom he was in business at the time. John Brown infamously went on to lead attacks against pro-slavery forces in Kansas in 1856 and to stage a raid on the federal arsenal in Harpers Ferry, West Virginia in 1859. For his actions, Brown and some of his followers were hanged for treason. The John Brown House remained in the Perkins family until 1942 when it was bequeathed to The Summit County Historical Society who remains its steward today. Options for block customization in TPAS are virtually endless. Recent TPAS projects have involved adding custom parameters to an existing condition survey block library, creating custom blocks in order to hyperlink non-jpeg data file types to the drawing, and building complex custom blocks for an in-depth survey and characterization of windows and doors. Let’s take a look at each case in more detail. The client for a dam floodgate investigation required data on the condition of individual steel truss members. An existing block library for surveying the condition of structural metals included blocks to record corrosion, deformation, cracking and other conditions. Building on this existing library, additional data inputs were added to each block so that surveyors could record the member type, additional notes, and percentage of section loss or failed fasteners, where applicable. In addition, a new block was created to record instances of leaking seals at the sides of the floodgates. Adding or removing fields and changing text display options can all be done in the source .dwg file of the blocks, as demonstrated in this video clip. This is a great option for quickly creating customized blocks based on an existing block library. Sometimes, entirely new blocks are called for. For example, during a building investigation involving the use of ground-penetrating radar (GPR), custom blocks were created to record surveryors’ observations and to hyperlink the GPR data files. Simple blocks such as these can be built quickly within AutoCAD, as in the above example. For creating complex blocks, or making batch changes to a library of blocks, AutoLISP (a simple list-processor programming language) can be a time-saving tool. For a survey of a large group of historic buildings, custom blocks were built from scratch using LISP routines, in order to capture highly detailed information on windows and doors. This approach essentially transforms a paper-and-pen survey form into a digital record complete with photographs keyed to an exact location on the drawing. These examples are just the beginning of the endless options for customization in TPAS. Please post in the comments below or contact Kelly if you have questions about block customization. TPAS capabilities are always evolving in response to the unique needs of our clients and to embrace advances in technology. Register here for a real-time demonstration and Q +A featuring the cloud-based Web Portal that allows teams to share data, analyze, generate reports, and export online. Today at TPAS University, Kelly Streeter shows how to create custom photo names using the TPAS Photo Name dialog box. The dialog box appears whenever TPAS is re-loaded, or whenever a TPAS drawing is opened in AutoCAD. You can also access the dialog box directly from the drop-down TPAS menu. Photos named in TPAS always include the X-Y coordinates of the accompanying text note. The X-Y precision can be adjusted, depending on the scale of the structure or site being surveyed. In most cases, a precision of “1” – yielding X-Y coordinates in whole numbers – is desirable. TPAS photo names usually include the block name, condition code, and year. These options can be turned on and off using the checkboxes in the TPAS Photo Name dialog box. The Prefix and Suffix fields allow powerful customization of photo names. You can enter any numerals or text that you want to be included in each photo name – for example, the name of the project or the surveyor’s initials. The Prefix and Suffix fields can also contain block attribute data about the condition photographed, such as the priority, severity or amount. Since block attributes themselves are customizable, the options for photo naming are endless. Please post in the comments below or contact Kelly if you have questions about this feature. In this installment of TPAS University, Kelly Streeter demonstrates two methods for extracting survey data from a TPAS drawing in AutoCAD. The first method, which uses the DATAEXTRACTION command, is available in all versions of AutoCAD and allows the user to fine-tune a selection of data to export from the drawing, including x-y coordinates. The second method, the ATTOUT command, is available in later versions of AutoCAD. It is much faster than the DATAEXTRACTION command, but does not allow the export of x-y coordinates, since it only exports block attributes. It is a great tool for quickly exporting raw survey data for analysis. Please post in the comments below if you have questions about these features. Welcome to the new TPAS website and blog! We are pleased to announce the launch of the new TPAS website and a fresh look for the TPAS blog! The new site includes more information, video tours, and downloadable guides for viewers who are new to TPAS. For new and experienced TPAS users, we are excited to present TPAS University, a series of instructional videos addressing frequently asked questions and providing tips for getting the most out of TPAS. We hope that you find the new site informative and easy to use. Please share your feedback with me at kelly@tpasllc.com. In this installment of TPAS University, Kelly demonstrates how to easily correct individual annotations or large batches of data using AutoCAD’s ATTOUT and ATTIN commands. The ATTOUT command exports a selected set of data to a tab-delimited file, which is easily edited in Excel. The data is then imported back into the AutoCAD drawing using the ATTIN command. This is a great tool for making batch changes to data, for example changing the priority designation for an entire group of conditions. It also works well for correcting smaller issues, such as typographical errors. This past weekend I had the opportunity to speak to a Bachelor Design Studio class from Boston Architectural College (BAC) and demonstrate the documentation of historic resources using TPAS™. 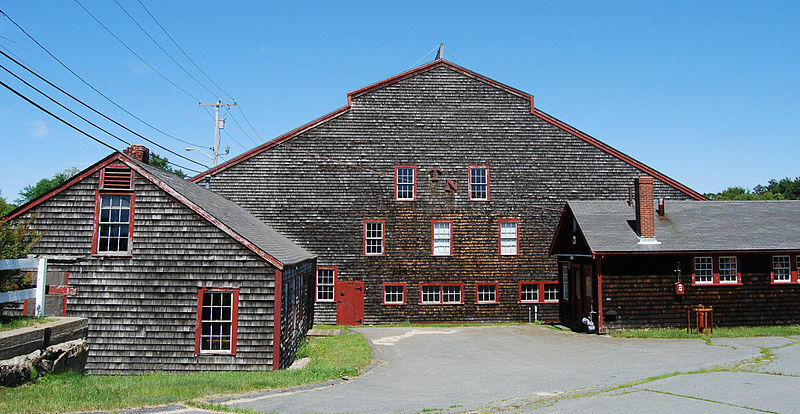 Professor Johanna Rowley is directing her students in a case study at the 19th century factory of the Tremont Nail Company in Wareham, MA, a practical application of research and field work with real world implications. Ms. Rowley first became aware of the site in 2011 while working on a BAC-funded project to investigate disaster recovery at restoration sites in the aftermath of the tornadoes that hit Springfield in 2011. The site was purchased by the town in 2006 when Acorn Manufacturing moved the nail operation and has languished unused ever since. Ms. Rowley’s goal is to mobilize her students and the community to help Wareham stabilize and document the site as an initial step in the effort to determine how the adaptation of the buildings and site could serve to fill existing needs of the community. I met with Johanna and her students to discuss the goals of the site inspection. The class had previously prepared background drawings from field measurements and archival data. We then went into the field, with two separate teams working together with a TPAS™ kit to document and photograph the existing conditions at the site. This information will now be used by the class to assess and prioritize the preservation needs of the site. It was a fun day at an amazing landmark. To follow the effort, “Like” their Facebook page.